Buy Now & Ship Later – The Benefit of having a COMC Account! One of the best features of signing up for a COMC account is the ability to buy cards now and ship them later! While you’re always free to purchase cards as an anonymous guest on our website and check out via payment methods such as paypal, credit card or check/money order, there are greater advantages of purchasing cards with your COMC account via store credit. Store Credit can either be obtained by selling cards on our site, or by purchasing the store credit through PayPal with a bank card and also by check or money order. You will first need to be logged into your COMC account. 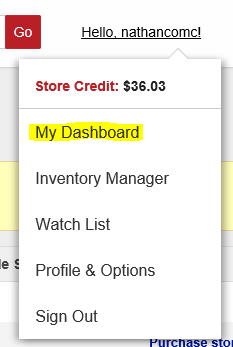 If you are just logging in now, you will be automatically moved to your COMC Dashboard. If you are not on this page, you can get their by clicking on your username on the upper right hand side of the screen and choosing My Dashboard. On the right side of the screen, you will see your Current Store Credit balance. Below that will be a link to Purchase store credit. The top option is to purchase COMC Store Credit with either a debit/credit card or a PayPal account. You can choose the Custom Amount option to buy credit in multiples of $10. Please note that you can request a full refund of any unused store credit within the first 30 days of purchasing it by choosing the Request a Refund option from our cashout page. Once you have selected the amount, click the Proceed to Checkout button. This will direct you to PayPal to finish the transaction.